Swindon Town have suspended three of their players and are investigating reports they inhaled nitrous oxide on a live social media video on Wednesday. 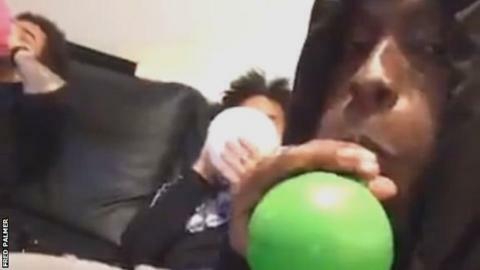 Images appeared to show Drissa Traore, Brandon Ormonde-Ottewill and Jeremy Balmy taking the legal high, commonly known as laughing gas, via balloons. "The club have already started an internal investigation into the trio's recent conduct," a club statement said. "They will not be considered for selection during this process." The Robins, who are 15th in the table, lost 2-0 at Oldham Athletic on Tuesday. Swindon have not won in six games since head coach Luke Williams signed a five-year deal on 9 March, following a run of six wins from 10 in interim charge. A new law designed to crack down on legal highs was due to come into force but has been delayed. Then-Liverpool boss Brendan Rodgers said he would speak to England forward Raheem Sterling, now at Manchester City, after he was pictured allegedly taking nitrous oxide in 2015.